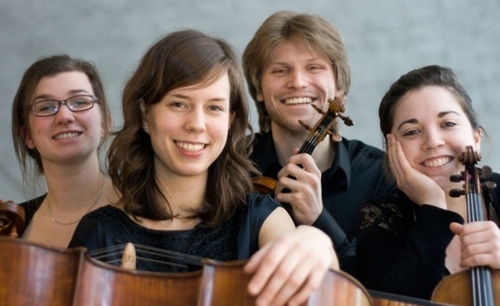 Luton Music will be guests at Princess Helena College for a Sunday afternoon concert with one of the most exciting young British quartets to have emerged in the last five years. The setting will be the antique panelled hall of this fine 18th Century Queen Anne mansion, standing in the village of Preston just outside Hitchin. Famously Haydn was a guest there in 1794, when the house was called Temple Dinsley and the programme will reflect that fleeting moment of musical history. This concert is dedicated to the memory of June Moore, a much loved member of Luton Music who died in June this year. She taught piano at Princess Helena College for 29 devoted years. Please note that this concert is on Sunday 11th January and begins at 3.00 pm at Princess Helena College. The college is kindly providing complimentary refreshments at the interval. Princess Helena College was established in 1820 as one of England’s first academic schools for girls. The college was founded for the orphaned daughters of members of the forces and clergy and took its name from Queen Victoria’s third daughter, Princess Helena, who became its President in 1874. Originally in Ealing the college moved to its present site in Preston, just outside Hitchin, in 1935. Known formerly as Temple Dinsley the main building is a magnificent Queen Anne mansion from 1714. At the turn of the last century the architect Sir Edwin Lutyens was commissioned to enlarge the house and redesign the formal gardens.